Genetics are what makes us up as human beings and all of our characteristics. With recent advances into technology, scientists have been able to find ways to manipulate our genes and thus change the way we see life and the possibilities that it possesses. On this website, we will investigate the different means of changing genes that scientists have found, the technology that allows it, and the large, debatable topic of Designer Babies. 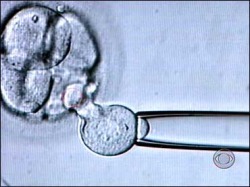 The scientific principles behind the creation of a designer baby involves IVF (in vitro fertilisation), which is a process needing ovarian stimulation, egg retrieval, selection of desired genes and then the embryo transfer.